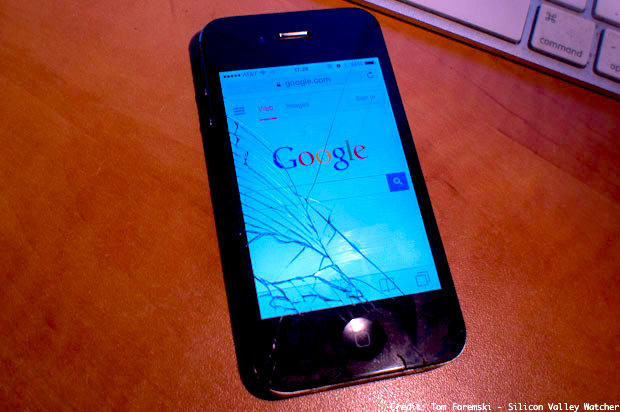 Google's costly smashed handset strategy. Take a look at the most recent quarterly financial reports from APPL and GOOG. Apple's quarterly revenues of $75 billion were $9 billion larger than a full year of Google's revenues: $66 billion. Apple's quarterly income of $18 billion equalled Google's entire quarterly revenues of $18 billion. Foremski's Take: It's a little shocking to realize that in 2015, well into this new century, Silicon Valley's most profitable and successful company is nearly 40 years old and makes its money selling tech hardware rather than web services. We're still living in the old world. Selling atoms in the form of smart phones and computers is far more lucrative than selling electrons in the form of web services and ads on a display. Google noticed that selling atoms was very profitable, if you were Apple. Four years ago, in his first year back as CEO, Larry Page tried to emulate Apple's hardware business by buying Motorola for $12.5 billion. It didn't turn out well. By early 2014, Larry Page announced the sale of the remains of Motorola to Lenovo for $2.91 billion --sweetened with a $1.5 billion loan from Google. Fortune names Larry Page "Business person of the year" in 2014. It's not easy being Apple as Google found out -- selling atoms is a lot different from selling electrons. Plus, the Motorola deal didn't make any sense. Why emulate Apple so closely, mirroring almost every business group? Google shareholders would not appreciate it. It reminded me of the $164 billion Time Warner/AOL merger in 2000 -- later called the worst ever in US history. The mismatch in investment philosophies of the shareholders in the two companies not only scuttled the deal but also triggered a huge selloff in tech stocks. In the late 1990s, amid the booming share prices of e-commerce companies, the investment philosophies of the shareholders of each company were polar opposites. Time-Warner shareholders wanted to own a "bricks and mortar" business -- they didn't trust new media businesses. AOL shareholders wanted to own a fast moving "clicks" based business -- they didn't want to invest in "bricks" -- a traditional media company. Neither group of shareholders got what they wanted in the merger and their rush to the exits precipitated a much broader sell-off in global tech stocks that took years to recover from: the dotcom crash. Time-Warner eventually managed to reverse the deal with the spin-off of AOL -- a nearly ten year process. Google risked a similar revolt among its shareholders if it pursued an Apple-type business. If Google shareholders wanted to own an Apple-like business they would have gone out and bought APPL shares. But they bought GOOG shares. There's a huge difference in investment philosophies. Larry Page dodged a bullet on Motorola by getting out from a bad deal plus he learned that selling atoms is much harder than selling electrons.